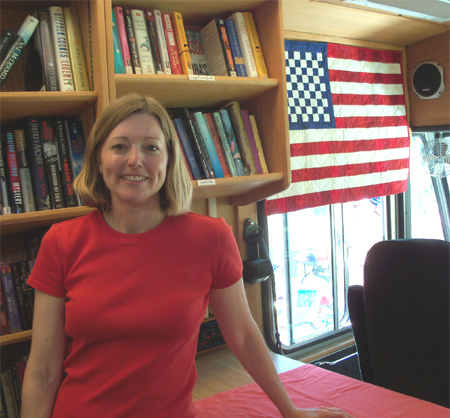 You are currently browsing the Bookmobile News weblog archives for July, 2011. In a testament to the generosity of Sonoma County residents, the First Annual United Way Children’s Book Drive netted 5,118 books for needy children and teens! This is a truly amazing number considering that we set out hoping to collect 1,000 books and the drive lasted a mere two weeks. Everyone involved responded beautifully. Thank you, first of all, to everyone who got into the sharing spirit by going home and scouring the family library for goodies. Thanks to all the host site Exchange Bank staff members who spread the word to their customers and encouraged them to fill the bins. Thanks to the can-do folks at JDS Uniphase, who got behind the drive in a big way to pull in some special collections for us. Thanks to all of the drivers and loaders who transported the books to the United Way office while Free Bookmobile staff was out of town. 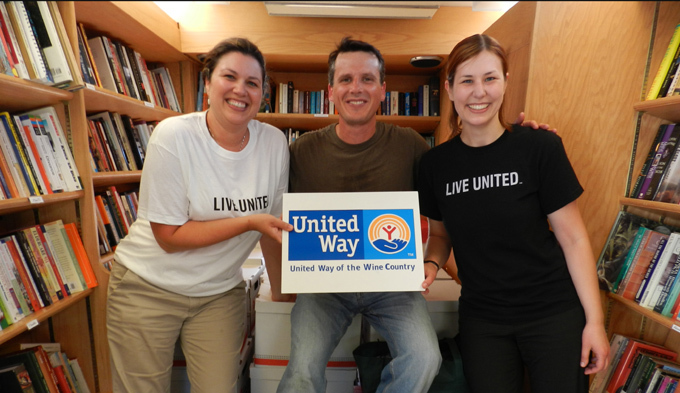 And of course, a huge thank you to the tremendous United Way of the Wine Country staff, especially drive coordinator Stacy Ruppert, Jennifer O’Donnell, and all of their team members who lifted, sorted, counted, labeled, and boxed the books. This is a real victory, boosting our supply at just the right time, and it will give thousands of children access to books that they wouldn’t otherwise have. We began handing them out at low-income summer programs the very next day! At the Free Bookmobile, we feel strongly about service to one’s community and thereby to one’s nation. America has a very proud tradition of creative, hard-working folks making a difference, making an positive impact on each other. It’s been our quest since the beginning to fly our flag and play our anthem in recognition of this spirit – the spirit in which we crafted the bookmobile. So we were very happy this Independence Day to finally realize that dream, on our second anniversary! We served our fellow citizens, our fellow Americans, at no less than four different events – a single-day record for the bookmobile. After beginning with the runners in Kenwood at the Hometown Breakfast fundraiser, we had the pleasure of joining a neighborhood parade and book drive near the home of Literary Arts Guild Director Melissa Kelley. Melissa puts a terrific quality of care and dedication into the Free Bookmobile and it seemed just right to capture her with our beautiful new quilted flag, created by Lois Breida. Lois is a Friend of the Seaside Library near Monterey, where she met my mother, Sandra Weaver, who is a past president. My mom wasn’t always involved with the library but her dedication and long hours when raising kids (and working full-time) nonetheless inspired me while launching the Free Bookmobile. Lois learned of our project through Sandra and was moved to help by lending her quilting skills. 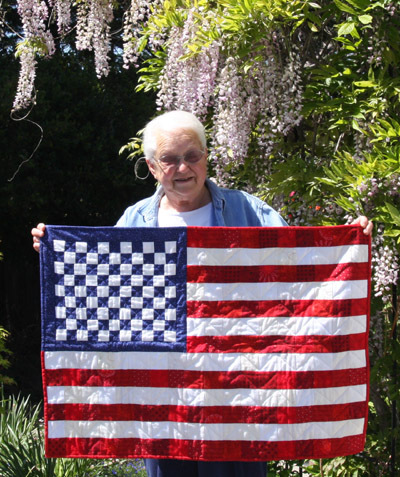 Despite some challenges during the process, she produced a quilt with special touches such as the stars and fireworks patterns on the fabric, and the inspirational words on the back. We are proud to hang it by the driver window, visible to all who board the vehicle, and will likely keep it there year-round. The parade was full of excitement, all the kids got books and bookmarks at the end, and then we set sail for Boyes Hot Springs and other eastern provinces. It was a great Independence Day. Thank you, Lois, for helping make our dreams come true! The best part is that everyone in the family gets involved, everyone helps, and Karina was the first to jump in as a shelver on board the new vehicle. She also earned a volunteer ride-along in the Free Bookmobile. She was ready to go on that March morning, and sure enough, put in a marathon day to help serve up over 1,100 books to low-income families. We”d like to take this opportunity to thank all of our volunteers who commit themselves selflessly toward our mission. Bill Brand and his wife have been putting in a lot of hours, always with a smile on their faces. And of course in terms of pure enthusiasm, Carrie Hess and Melissa Kelley are just wonderful. We couldn’t do this amazing work without you!